Young becomes the first player to go into the referee's book after a foul on Pedro. The exciting match as expected is still goalless at Stamford Bridge as both sides are involved in the early exchanges of the game. Herrera draws first blood for Man United as he stoops to head the ball home after he beautifully met a cross. It's 1-0 to the team from Manchester. Man United fans seem to have the loudest voice at Stamford Bridge as they hail their Norwegian manager Ole Gunnar Solskjaer. United were lucky not to have got an immediate response through Spanish attacker Pedro as he loops the ball over Romero before curling the ball wide. Hazard and Rashford make a challenge for the ball but the Englishman follows through the Belgian and catches him hard. Man United still lead by 1-0 through Herrera's header and Pogba providing the beautiful assist. One out of his many under Solskjaer this season. Provider turns goalscorer as Man United double their advantage through their star player Pogba. Rashford with the pin-point cross and Pogba with the diving header. It's everything to play for as Chelsea will need to put up their best performance this season to overturn the two-goal deficit in the first half. 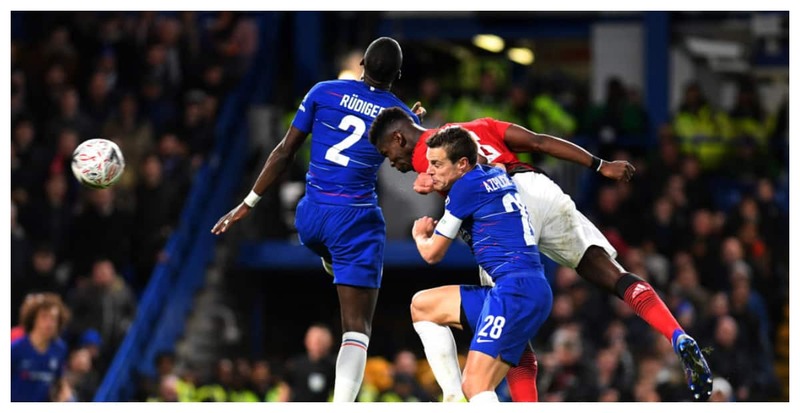 Just as Chelsea are trying to show urgency in the match, Rashford catches them on a brilliant counter attack, beating Kante and Azpilicueta before finding Lukaku in the box but Luiz saves his team's blushed. Matic who is already booked is lucky not to have been sent off as he commits two fouls in quick successions and Chelsea fans are boiling over. Luke Shaw brilliantly launches a brilliant tackle as he denies Pedro and Chelsea a glimmer of hope. The Englishman with his goalkeeper teammate are both down with injuries in the process. Pedro drills it miles out to the back of the box and it's wasted. Frustration is beginning to set for Chelsea. A like-for-like substitution for Pedro comes out for Willian. Hazard drives forward and cuts inside at an incredible pace and cracks it at goal and Lindelof does well to block. United breathe a sigh of relief. With little over 20 minutes to play it looks like Chelsea are on their way out of the FA Cup and Man United will be having the last laugh. Maurizio Sarri does a tactical change as Ross Barkley comes on for Matteo Kovacic. Sanchez in for Lukaku while Mata makes way fro Andreas Pereira. The changes have yielded no results for Chelsea as Man United are looking forward to the finish line. Chelsea fans are singing: "you're getting sacked in the morning." and the Italian brings on Zappacosta for Azpilicueta. For a side down by 2-0, a defender for another seems out of the picture for Sarri. Chelsea fans are leaving the stadium one after another not because their team are not creating chances but because United are the stronger side on the night. Five minutes added to the normal 90 and it looks as if the match will go for another half hour because it's been disappointing all night for the Blues. It's all over, Man United have completed the last slot in the quarter finals of the FA Cup and sweet revenge from last season's final. Solksjaer is now 13-1 with United. Impressive record.